You’ll see many benefits of having us be your professional roofers. Experience- In order for a roof to fulfill its purpose, it has to be installed, replaced or repaired correctly. Like a deck of cards, each shingle relies on the structural integrity of the shingles surrounding it in order to provide the full protective capability. With our decades of professional roofing experience, you can feel confident having us be your professional roofers. Warranty- We provide not only the manufacturer’s warranty for the products that we use, but we also will provide our customers with a 10-year warranty on our workmanship. Additionally, we take great care to install materials in a way that is compatible with the manufacturer warranties. Fair Pricing- Instead of giving you a low-ball offer at first and then driving up the cost with hidden fees, we choose to give you a fair and reasonable price up front. 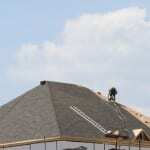 We also offer free, no-obligation quotes for anyone looking for professional roofers. For more information about the professional roofers here at Slippery Slope Roofing for your Midhurst, Ontario home or commercial property, give us a call today!